Okay guys, back to my normal blogging routine after Tuesday’s whirlwind! The response to my blog post on my feelings about Instagram was so much greater than I had expected. I was truly overwhelmed by your encouraging words and sweet notes. Thank you so much for reading that lengthy blog post and sharing your honest and open opinions about the topic with me! I received many thoughtful comments and constructive feedback and I’m thinking about a way to bring all the ideas back to you. I must admit that I was scared to hit the publish button as I feared negative people or people taking my message the wrong way, but I should not have doubted the blogging community so much! You’ve all responded in such a warm way and made me realize that I am not the only one struggling with social media. I’ve been focusing on the negative trend so much that I lost sight of all the positive. I want to say thank you one last time for reminding me of all the good things about Instagram! Summer seems to be slowly leaving us and the first signs of fall are starting to show. The days are noticeably shorter, there has been plenty of rain clouds and the first trees are starting to turn golden and brown (I’m looking at you, chestnut tree). Before we know it it’ll be time for Starbucks PSL, cozy cardigans, cheesy Christmas movies and cinnamon-everything again! Ah, I can almost taste the roasted chestnuts! 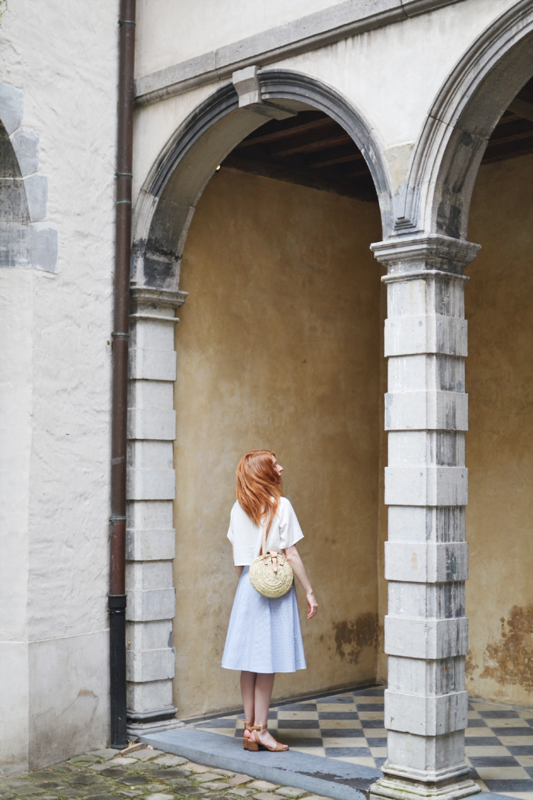 September is still a few weeks away, so I will try to share as many of my favorite Summer outfits as I can before I need to bring back the sweaters and chunky knits! Due to some issues with Mother Nature it hasn’t been easy to get all my favorite summer looks photographed. Last weekend we got lucky when the sky cleared up for a short time after we had visited the market. 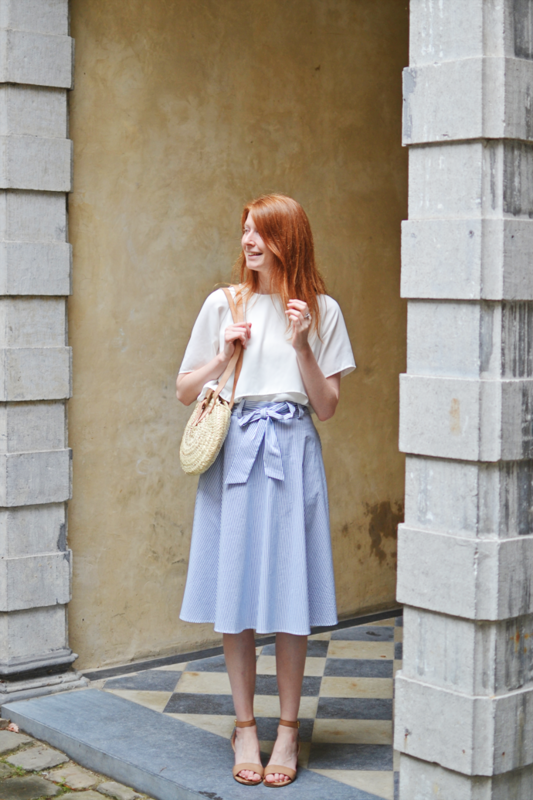 With a big bunch of fresh eucalyptus in hand I danced around one of the most beautiful hidden places of Antwerp – Vlaeykensgang – to get photos of my favorite summer skirt! I wasn’t looking to shop, but when I passed by the Compoirs des Cottoniers shop window in Sevilla this skirt stopped me dead in my tracks. 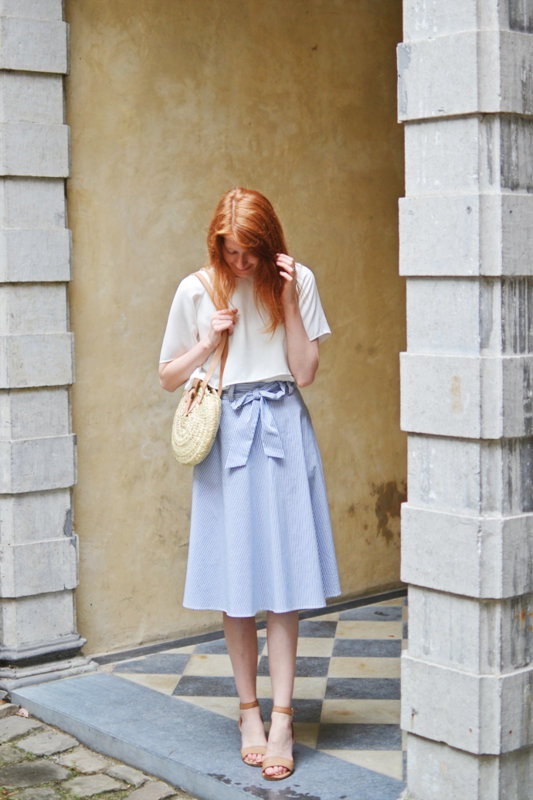 Midi length, vertical stripes, white and blue and a cute bow? I had to have it. I’m a little sad that I couldn’t get more wear out of it since summer basically was over at the end of June and we’ve had nothing but rainy days since. Hope you are having a good week despite the rain! You look cute! I did also enjoy reading the instagram post. I’ve decided to mostly use Instagram for myself, rather than for my blog, which takes a lot of pressure off. I follow a lot of users who I find interesting, even if they will never follow me back, and I take lots of pictures of my baby, even if it isn’t interesting to followers. But I think how society as a whole and how we personally are affected by instagram is so important to have conversations about, so thank you.